MACOMB, IL –- The battle between Western Illinois University and Brigham Young is underway for the NCAA 6th Fan Championship, with the winner taking $100,000 in scholarship funding. To help boost WIU's totals in the race for $100k, three voting "parties" have been scheduled on the Macomb campus. Individuals with a WIU account (username and password) are invited to Morgan Hall 126 from 5-8 p.m. Wednesday, March 12 and Thursday, March 13, and from 8 a.m.-3 p.m. (contest end time) Sunday, March 16 to log lots of votes for the Fighting Leathernecks. Pizza will be provided Wednesday and Thursday, with doughnuts being served Sunday morning. Fans can vote for Western by going to wiu.edu/voteWIU and following the instructions. For making the Sweet Sixteen cut, Western earned $10,000 toward the University's general scholarship fund. The institution with the most votes by 3 p.m. (CT) Sunday, March 16 will win the championship. 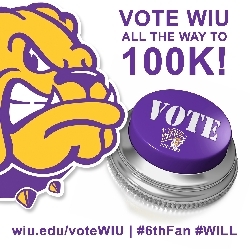 Fans may also continue voting once per day via Facebook and Twitter (by using the hashtags #6thFan #WILL) and or multiple times via 6thfan.ncaa.com (or wiu.edu/voteWIU ).